teamwork warriors in unique outdoor team building activities. Games For Thrones is a boisterous and outrageous team outing idea that will have your group laughing and working together in a series of very unique competitive team bonding activities. 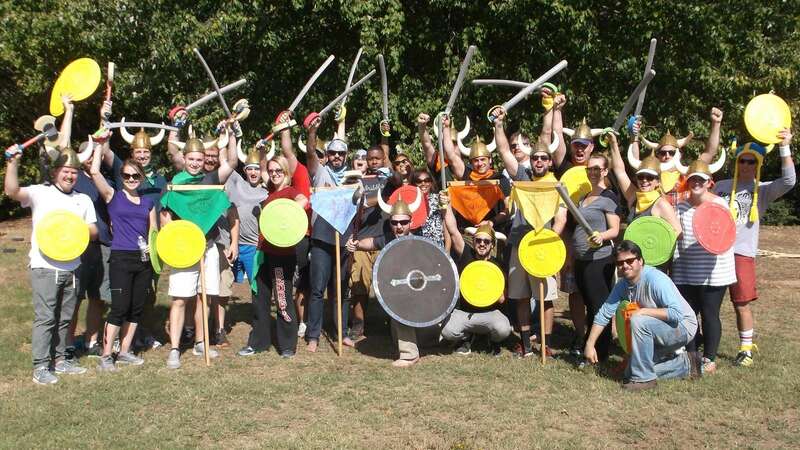 Games such as the Catapult Challenge, Crossbow Tag, and Sword Duels make this a unique and memorable Game of Thrones team building day. Each Royal House competes for their team honor and the glory of victory! Welcome & Warm-Ups (20-30 minutes) Atlanta Challenge staff welcome the participants and set expectations for the Game of Thrones team building. We then lead some fun warm-up activities that also randomly create small teams of 8-10 people. Team Up! (5 minutes) Each team creates a name, war cry and team flag which represent their commitment to claiming the ultimate honor. Event Intro (5 minutes) Our staff hand out any sup- plies the teams need, and review the rules and time- line for the program. Catapult Castle Bust: Use a 4-foot catapult to take out an opposing team’s castle, while your team races to build their own castle under fire. Sword Duel: Opponents face off in the sword duel ring, but the rest of each team can reach in and take a swing as well. Only cunning warriors will survive! Dragon Golf: Pitch dragon eggs toward the goal in this fast-paced, group-scoring field game. Battle Ship: A battle at sea with a bit of dodge ball, and a lot of strategy. Quarter Staff Fight: Partners try to knock opposing team members off a set of logs, while dodging the incoming shots of the non-fighting participants. Crossbow Tag: In this medieval version of laser tag, teams race to gather ammunition (foam darts) and then fire at the opposing team. Coordination, cooperation, accuracy and strategy are key to success! Half Time Show (optional) (20-30 minutes) To en- sure that no one gets overheated, we take a short, entertaining break half way through the program. Each team develops a brief, warrior-themed show to present to the group. Winner Presentation We acknowledge the high scoring team for each game, and the overall winner of the outdoor team building activities. Wrap-Up (10-15 minutes) Teams finish the team bonding activities by sharing their insights about what it takes to be a successful warrior (team player) and how they can work together to be a successful kingdom (team). Build morale and camaraderie to enhance team bonding. Relieve stress and reinvigorate the team. Build a competitive spirit and champion mindset. Location: Outdoors in a large open space, or inside a gym or similar space. Includes: Complete facilitation, all event materials, and event pictures.